A town or village’s historic movie house is where memories come alive. People come out of the woodwork to tell you about how they met their wife at the town theater, or that’s where they held their first recital. But the economics of time and a community’s tight budget all too often have rendered those memories a victim of the demolisher’s craft. To restore these facilities to their original glory is costly. There is little debate about that. What causes consternation in preservationist circles is how far we can go in changing these historical facilities to create a new economic model that not only makes the restoration affordable but also makes these movie theaters viable for generations to come. The economics of historic preservation requires us to rethink our standard definition of architectural restoration. Traditionalists would require us to be true to the original design, with little or no flexibility for expansion, modification or the use of new technologies that allow an old facility to be adapted for new uses. In many instances, historically accurate restoration should be the goal, but it should not be the only model available to those of us who want to save these architectural gems. 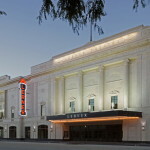 The Lerner Theater in Elkhart, Indiana is a classic example. With its façade anchored by four two-story tall Ionic columns, the theater has been home to vaudeville acts, movies, and civic events since if first opened in 1924. But as we turned the page to the 21st century, the Lerner was in need of repair. In 2008, public and private dollars came together to save this ornate facility and city leaders made the decision to find new uses for the old facility that would generate a revenue stream. 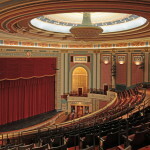 Inside the theater, the renovation was as accurate as a jeweler’s eyepiece. The gilded plasterwork was given a new glow and the seats were refreshed with deep red upholstery. Restoration of the theater’s signature ‘mushroom’ chandelier required scaffolding that took several weeks to construct. The workers restored every authentic detail. 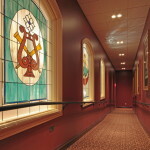 Outside the theater, a new ballroom was built that mimicked the theater’s architectural details. 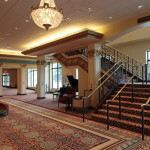 The Lerner Theater Crystal Ballroom created an architecturally seamless facility that now hosts business meetings, weddings and large banquets that generate revenue that will make the facility self-sustaining. A traditional approach would require any addition to an historic facility be architecturally distinct from the original building. Think of I.M. Pei’s glass pyramid at the Louvre in Paris. A traditionalist would not extend the ornate detail of a marble floor or the intricate cornice work that captures our artistic eye when we enter an historic building. The new part of the facility would need to make a complete break with the past. Today, we have many new options that allow us to reshape these buildings. Advancements in material technology allow us to recreate the look and feel of an historic building without encountering the price tag of an historically accurate restoration. New lighting technology gives us the added flexibility to highlight the elegant details of a facility and of course modern day heating and cooling systems allow us to use these spaces year round. These projects also benefit from our ability to shrink the size of lighting and sound systems, among other things needed to retro fit a facility. Technology is shrinking the size of most everything and it gives us greater creativity in finding new uses for old facilities. The historic movie theaters across the country need to be saved and restored but the tight economic realities of our time require us to expand our definition of historic preservation. There are simply too many fine examples of various types of architecture for us to relegate these facilities to museum pieces. These facilities have enduring qualities; they are our touchstones with the past. They are the places where the memorable parts of life occur. We should be using every tool, every advantage at hand, to save these architectural gems.